Boomi ry is the Association of Business Students in University of Tampere, founded in 1968. Boomi is one of the largest student organisations in the University of Tampere with its over 800 student members, ranging from first to sixth year in their studies, studying Management and Leadership, Marketing, Accounting, Economics, Insurance and Risk Management, Business Law, Tax Law and Sustainable Business Management. 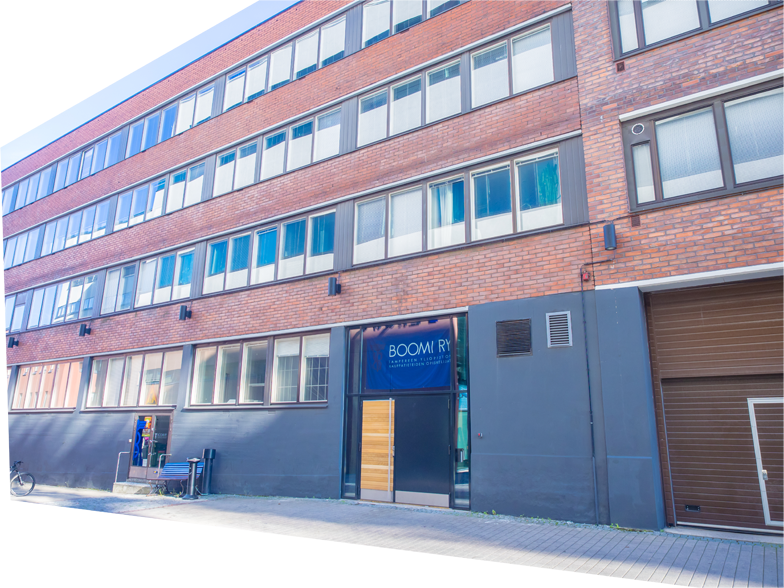 All the degree students in Business in University of Tampere can become members of Boomi ry. It is one of the most active student organisations in Finland and the most active one in Tampere. Boomi organises leisure activities for its members and hosts some of the biggest student events of the city: the ’Hämeenkadun Appro’, the biggest student event in Finland (more than 10 000 students from all over Finland), the ’Särkän Märkä’ where student partying meets the rides and the sights of Särkänniemi amusement park, and of course the one and only ’Haalaribileet’, literally translated as the overall party, eight times a year, as well as numerous ’sitsit’ where people gather to eat, drink and sing with each other. In general, people in Boomi know how to have fun. Boomsport is the sports society of Boomi. It organizes weekly floorball and volleyball game sessions and monthly various try outs in different sports such as hot yoga, ice swimming and laser tag games. Boomi has also its own golfclub, so if you are a professional or want to experience something new, feel free to join the indoor and outdoor practises. Boomi has its headquarters, called ’Boomilaakso’, just opposite the lower doors of the Linna Building of the University of Tampere. Boomilaakso, Boomivalley in English (in reference to the infamous Moominvalley of the ’Moomins’ from Finland), is open on weekdays from 10 a.m. to 4 p.m. Whenever the Boomilaakso is open, there is always a Boomi board member on call to help you. Boomi is your link to numerous student happenings in Tampere and other Finnish cities. We warmly welcome you to join the activities and meet our students, both Finnish and foreign. We wish you an unforgettable stay here in Tampere, whether it is just for five or six months of Erasmus or even for a lifetime! Most of the events that Boomi organises are open for exchange students. Attending to various student parties and pub crawls such as Hämeenkadun appro, visiting the adventure park called Särkänniemi, having a picnic at a park, brunching, lunching or having a dinner together, going to the movies and doing sports together with other students make your stay here very memorable. Stay tuned and follow Boomi ry on social media to get the information of the events and activities! You can also ask your tutor and the international organizer of Boomi if you have any questions about student life in Boomi. International degree students who study business, for example Leadership for Change students on Sustainable Business Management track, can become members of Boomi, the Association of Business Students in Tampere. Becoming a member means paying the membership fee (15€) every academic year and enjoying the number of services that Boomi offers for its members. The membership fee can be paid from a Finnish bank account. The services include free coffee in our clubroom, right to purchase your own pair of student overalls (navy blue outfit that you can wear in many student parties) and the right to join the events organized for Boomi members. Boomilaakso, the headquarters of Boomi, is like a living room, where the members can enjoy a cup of coffee between lectures, chill out and play board or video games. You must respect the other users of the living room and take care of the place like it was your own. Boomilaakso is open from Monday to Friday 10 a.m to 4 p.m.
We also have our very own night club, Klubi 57, which consist of a function room, a kitchen, a traditional sauna and a meeting room. Many sorts of parties and events are held at Klubi57 all year around. The function room and Sauna57 are also rented for private events, but they are mostly used by the students of Boomi. Also other student associations from our University can book Klubi57 for their events. Partying all night and enjoying good company and sauna are very common leisure activities for students here in Tampere and of course for international students too. Boomi ry is a student association that takes care of its every member by improving different school, study and wellbeing-related matters. It is an important link between business students and Faculty of Management and University of Tampere. With the help of Boomi ry you can get your point of view to our University’s administration and faculty. Boomi ry cooperates with the Student Union of University of Tampere (Tamy) taking action in the field of national educational political issues that are important to the whole University. Boomi ry also takes care of exchange and international degree students by organising international tutoring in the beginning of the semester and helping out in every kind of situations concerning studying, living or leisure time. You can give feedback and all kinds of improvements and ideas concerning student life, studying or activities to the international organizer of Boomi or any other member of the board of Boomi. We are here to help you and answer to your questions! Stay tuned on Facebook where you can get most of the information of upcoming events and all sorts of activities or ask your tutor who is always there for you. Wishing you the best time in Tampere!